The EZform System is sold as a complete system rather than individual components. You are buying the form as well as the dowel instead of just lumber and a piece of plastic and then purchasing a dowel separately. The system is priced competitively with the total cost of other systems, however with the EZform System, you could experience dramatic savings in labor costs. 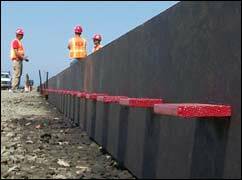 The biggest variable in any construction project is direct labor. 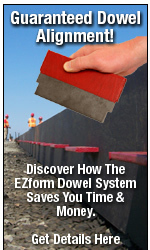 The EZForm System is designed to reduce the amount of labor required to install construction joint dowels while actually increasing the overall performance of the load transfer system by guaranteeing that the dowels are installed correctly first time and every time. With the EZform System, contractors experience less labor cost associated in many of the steps needed to install traditional construction joints. Some of the eliminated steps include: culling lumber, cutting back chamfers with electric saws, measuring and marking for dowel holder placements, nailing dowel holders, repairing broken, crushed or paste filled holders, and bending nails associated with holders. With EZform, there are no dowel holders as the board features a pre-cut dowel slot. Also, because the form itself is made of super-strong engineered wood, they tend to stay straighter than lumber and require less labor to repair crowns and bends once the form is placed. 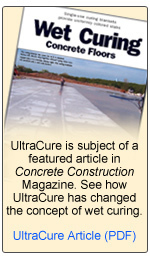 Another additional cost savings is equated to the re-use of the EZform board itself. With proper care, the form can be re-used several times eliminating the need to purchase additional lumber for future pours.